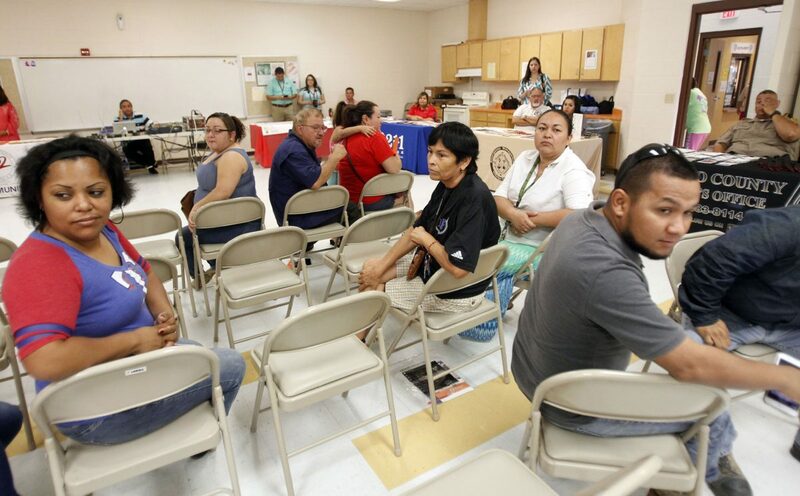 Community residents from South Alamo listen to the agencies participating in the Hurricane Preparedness Dare to Prepare fairs at South Tower CRC in Alamo Monday June 19,2017 in Alamo. SAN JUAN — Seven days into hurricane season, dozens of residents stopped by the San Juan Community Resource Center for a quick emergency preparedness educational session. Tuesday marked the second of five Dare to Prepare events hosted by Texas A&M colonias program in conjunction with the Hidalgo County Office of Emergency Management. Representatives from the Federal Emergency Management Administration, Hidalgo County Emergency Management, Hidalgo County Drainage District No. 1, National Weather Service, Lower Rio Grande Valley Development Council, Hidalgo County Sheriff’s Office and other agencies provided pamphlets and materials, like rain gauges, to residents. “Preparation goes beyond putting together a kit, among other things, it also involves removing debris, which contributes to flooding, and knowing when to evacuate,” Hidalgo County Judge Ramon Garcia, who also serves as the county’s emergency manager, said in a statement. Preparation, according to FEMA representative Robert Nix, also includes assessing the benefits of having flood insurance compared to disaster assistance and handed out flyers to residents. According to the flyer, flood insurance claims are paid even if a disaster is not declared by the president. Jaime Salazar, engineer for Hidalgo County Drainage District No. 1, urged residents to report illegal dumping, the “biggest, biggest problem” for obstruction of drainage ditches. Debris, he said, can contribute to flooding since rainwater is released into the drainage systems and onto the Laguna Madre to alleviate water on roadways. The drainage district, which conveys stormwater released by cities into the county system, operates about 589 miles of ditches in the county and prepares for heavy downpours year-round. “It hasn’t rained (lately), but that’s good for us because this is the time where we can do the improvements; we can do the cleaning (of the drainage system),” Salazar said. Meanwhile, Pablo Gonzalez, the information technology officer with the National Weather Service in Brownsville, told residents to have seven days worth of food and water ahead of extreme weather events. “In the past, we have told people to prepare for a three days supply of food and water for each person, but seeing the results of (Hurricane) Harvey, now we’re recommending a week’s supply,” he said. The next Dare to Prepare event will be held beginning at 10 a.m. Friday at the Endowment Community Center located at 107 N. Sunflower Road in La Blanca.